Corvette fans can thank designer Ryan Vaughan for helping to fix what has been one of their biggest gripes about the sports car: a lackluster interior. In 2009, Vaughan's theme for the cockpit of the seventh-generation Corvette was picked from hundreds of entries by GM designers from Detroit to Brazil to Korea as part of an unprecedented global design competition. The cabin of the 2014 Chevrolet Corvette Stingray, launched last fall, has won widespread critical praise for refined touches such as carbon fiber and aluminum trim and a driver-friendly layout that includes a sweeping shape from the center console through the driver's door. For Vaughan, a Maryland native hired by GM straight out of the Pratt Institute design school in Brooklyn, penning the top design might have been the easy part. Early on, engineers thought the innovative dash-into-door setup would be too difficult to assemble in the factory. Vaughan was among a group of designers and engineers that huddled at the Corvette plant in Bowling Green, Ky., to figure out an innovative work-around that allows a line worker to manually align the instrument panel and door. It saved Vaughan's design. "Being able to keep that element was the key in allowing us to achieve a design that is really expressive and has a lot of drama, but at the same time it doesn't get in the way," Vaughan says. "It's a functional, ergonomic environment for the driver." 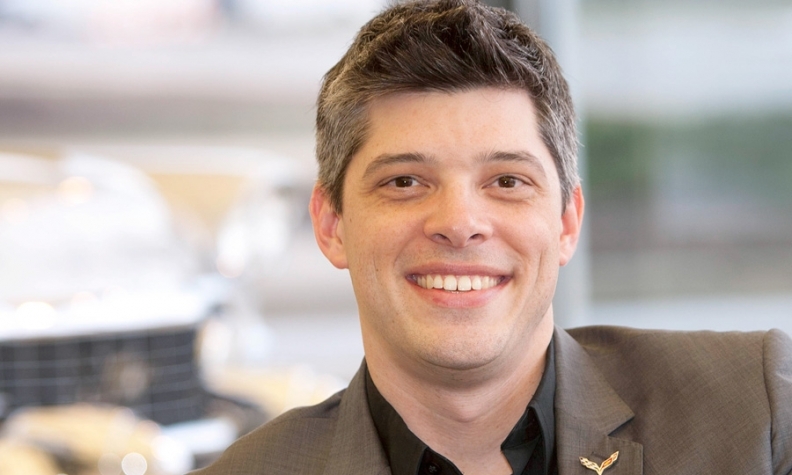 During a 12-year GM career, Vaughan has led interior designs for the 2008 Chevrolet Malibu and 2010 Buick LaCrosse, among others. He also has worked in China and Brazil. Vaughan's interest in cars came from his father, who kept a 1966 Corvette in the family garage.